Creating a new skin for WisBar Advance is simple, once you've chosen the graphics that you wish to use. WisBar Advance's (WA for short) skin file is a simple INI file with a .wisbar extension. Each file must contain a section indicating the name of the skin and the DPI (dots-per-inch) that the theme supports. Optionally, this header can also contain the author's name and his/her email address. If you look carefully, you will see several items. First, the items in the skin file are separated by the "=" symbol. Also, if you look at the "DPI" field, you will see that it is set to "192". This indicates that the skin has graphics files appropriate for VGA (480x640) resolutions. For a QVGA (240x320) theme, you would specify 96 as the DPI. And, for the new 320x320 devices, you would specify 128. As a note, WA3 no longer scales skins from one resolution to another due to the added support for 128 DPI devices. The "Notes" value allows you to add additional notes to be displayed on the theme selection page. You can have a maximum of 249 characters here. Finally, the last line preceded by a "#" symbol is a comment. Comments must always begin with the "#" symbol and can be placed anywhere in the file. One thing to note is that all of the paths to the images and sounds are relative to the location of the skin file. That means that you should NOT use absolute paths. So, for example, if your skin file resides in "\Program Files\Lakeridge\WisBar Advance\Themes\My Theme", then that path will be prepended to any path specified in your skin file. So, "image.bmp" will be translated as "\Program Files\Lakeridge\WisBar Advance\Themes\My Theme\image.bmp". The final item is the "PleaseWait" entry. This specifies an image that will be displayed while WisBar loads and updates the current theme. If no image is specified, WisBar will use the default image. Animations are a new feature in WisBar Advance 3. Animations are described by a file separate from the main skin file. For the taskbar buttons and the wait cursor, you can specify these files instead of an image file. Creating an animation file is done through the Theme Manager's "Animation Tool". In that tool, you can specify the image, how many frames the image contains, how many milliseconds elapse between frames and whether or not the animation loops. One note about the image, each frame of the animation needs to be the same width and height, and must appear sequentially in the image. For example, if I wanted to create a 32x32 image with 5 frames, the resulting image would need to be 160x32 (32x5). The first frame would be placed at (0, 0), the second at (32,0) and so on. The taskbar is the heart and soul of WisBar Advance. From this location, most of the functionality is accessed. The management of tasks and several system controls are available here. Also, this bar is visible from nearly every application on your PocketPC, therefore it is essential that it appeals to you visually. We will address each of these items in this section. You can also specify a portrait and a landscape image. 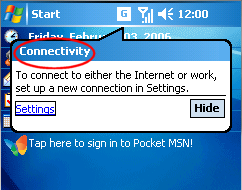 The gradient, WM5 and WM6 modes are useful in recreating the default taskbar's background on Windows Mobile 2003, Windows Mobile 5 and Windows Mobile 6, respectively. Within each mode, you can specify a starting and ending color, or you can instruct WisBar to use the colors specified by the current Today theme, for a fully-integrated look. The first two values specify the image to be used when in portrait mode and in landscape mode. WA3 can detect the different orientations of the screen, so you can specify a special version for landscape. The portrait option is required (as most devices still run in this mode 90% of the time). If the landscape setting is not set, then the portrait image will be used instead. The next setting is "Mode". This can accept the following values: Scaled, Tiled, Color (for a solid color),Gradient, WM5 and WM6. The next four options are only used if Scaled and Tiled are not specified. If you choose to use the gradient, WM5 or WM6 options, then you can either specify the colors manually, or you can use whatever the current today theme's colors are set to. This is set by the "Use Theme Colors" option. If you choose to set the colors manually, then WA will read the colors set by "Left Color" and "Right Color". Colors in WA themes are represented in reverse hexadecimal form. In other words, the colors need to look like this: 0xbbggrr (where r=red, g = green and b=blue). Each value needs to be within the range of 0 to ff (0 to 255). You can use the Windows Calculator on your desktop to help you convert these numbers. So, for example, if you wanted to specify solid blue as your color (represented by RGB values red=0, green=0, blue=255), you would enter 0xff0000 as your value. If you wanted to specify black, you could just put 0 (WA would interpret that as 0 intensity for each color component) while if you wanted to specify white, you would enter #ffffff. So, getting back to our skin, we can see that in the above example, the background's gradient colors are set to black on the left and white on the right, giving kind of a grayscale effect. If we had specified "Color" as our background mode, the "Solid Color" option would be read and the bar would have a blue background (0xff0000). The next two options, "Left Margin" and "Right Margin" are unique to the taskbar. Normally, the buttons begin at the far left and far right sides of the screen. These options allow you to specify how far from the edges to begin placing the buttons (in pixels). "Use Start Effect" instructs WisBar whether or not to use a image that will be overlaid on top of the taskbar background, but underneath the start menu button. This allows for the creation of effects, similar to what you see when you press the start button on the builtin taskbar (the white gradient effect). "Start Effect Path" is used in conjunction with the "Use Start Effect" option. This allows you to specify the path to an image to be used as the background for the effect. If this path is blank, WisBar will create a semi-transparent, white gradient that will be displayed when the start menu button is pressed. Buttons on the taskbar consist of two images: a normal state and a pressed state. It is important to make sure that the two images are the same dimensions. These buttons also support transparency. The "transparent" color (or the color that won't be visible), is the color Fuschia (RGB(255, 0, 255)). This is a departure from WA2.x themes. There are a couple of values in the above section that we need to look at. First are the SIP values. The SIP button is the button that will bring up the virtual keyboard, Transcriber, etc. This button is only visible if the taskbar gets moved to the bottom of the screen by an application, which is rare these days. In the example above, we didn't specify any images for the button. In this situation, this is okay because WisBar Advance will provide an image, just in case. This is not the case with the other buttons. One important thing to note: If you leave a path blank, WisBar will use the default image. This way, the user will still be able to view a button on the taskbar, even if no image has been specified. The other thing that needs to be noted is the battery/memory button. This is a special case button as WA will draw additional information on it. If you color the graphic correctly, WA will use the button as a live meter for both the battery power and the free RAM available. The colors in the far-right column will be selected for the battery. The bottom pixel will be used as the unavailable color (it will be used to display the used portions of the battery). The next pixel above that represents the battery at 10%. The next above that represents the battery at 20% and so on until you reach 100%. The memory colors are picked from the next column to the left and follows the same pattern. The bottom pixel will be used for unavailable bars. The next pixel up will used for one bar, the next up for two bars and so on until you reach five bars. If you notice, these three sections take the same values. The "Color" and "Shadow" values take color values as described in the taskbar background section above. In the case of all three fonts above, both the shadow and the text are being rendered in black. The "Style" field can take several values, each separated by a comma. These values are "Bold", "Italic", "Underline", "Strikeout" and "Shadow". The volume dialog is an optional element to skin. If you choose not to skin it, WA will render the dialog as a panel with the WM6 gradient at the top. Unlike the other images, the volume bubble is limited to a specific size. On QVGA devices (240x320), the image needs to be limited to 75x185. On VGA devices, the image needs to be limited to 150x370. Of course, if you're designing a QVGA theme, then the image will be stretched appropriately on VGA devices. The image uses RGB(255, 0, 255) as its transparent color. So, anywhere you specify this color, whatever is underneath it will show through. Also, at coordinates (13,43), a slider of dimensions 22x84 will be placed. And at coordinates (14,135) and (14, 152), two radio buttons of dimensions 35x17 will be created (double all of these values for VGA devices). These items are the volume controls and cannot be moved. New in WA3, you can specify an image for phone devices. The "Phone Image" option is only used on phone devices and the "Image" option is used on non-phone devices. In the example above you will notice that the background items are similar to the taskbar's background items. In addition to the background settings, this also contains font settings, similar to those described in the taskbar section. There is a new value in this section, however. That is the "Display New Text" value. If this value is set to TRUE, WA will render the text for the "New" button. However, if this value is set to FALSE, then the text will not be rendered, allowing you to place a custom graphic in its place. There are several entries in this section that are unique to the application menubar. These are "Normal", "Pressed" and "Disabled". These values provide images for the different states of the individual buttons on the menubar. As with the taskbar buttons, it is important that these images have the same dimensions. WA does not simply draw these images as you have drawn them. The reason for this is that buttons on the menubar are not always the same size. So, WA will do some partial stretching in order for the buttons to look correct. This is how it works: first, the image is stretched vertically to accommodate the height of the button. Then, the left three pixel columns of the image are not stretched horizontally, allowing for properly rounded corners. The right three pixel columns are also not stretched horizontally. However, the remainder of the image is stretched horizontally to fill in the remaining section of the image. Then, the text or icon is rendered on top of the button image. If you remember to keep any rounded corners to three pixels wide the button should look correct when rendered. In WA3, the font settings have been removed from the [Application Menubar] section and moved into their own sections. This allows you to specify different fonts for the normal and pressed states. When a button is disabled, WA will use the normal font, but gray-out the text. The section for the pressed font is "[Menubar Pressed]" and is laid out identically to the section above. SoftKeys are specific to Windows Mobile 5 and Windows Mobile 6 devices. In many programs, these replace the standard application menu buttons with two large buttons from which all menu functions are accessible. Most of the options above are identical to the application menubar options. New in WisBar Advance 3 is the ability to specify an image for the SIP Pressed state (WM5 and WM6 devices only). If this opiton is left blank, then a gradient image, similar to what you see on WM5 and WM6 devices, will be used. One more thing to note, for best results, the buttons images should be 90 pixels by 26 pixels (180x52 for VGA devices). This limitation can be worked around, however, by using the "Left Margin" and "Right Margin" options. These specify sections of the image (in pixels) which are not stretched when changing orientations. For instance, if "Left Margin" is set to 3, then the 3 leftmost pixels will not be stretched. The same is true for the "Right Margin", except that it applies to the right side of the image. The softkeys now have their own font settings. These are set up exactly like the fonts for the Application Menubars. The section names are "SoftKey Normal Font" and "SoftKey Pressed Font". There are entries for the different states of the button: "Normal", "Pressed", "Disabled" and "Focused". These are pretty self-explanatory. However, just as a note, the focused state occurs when keyboard input will be sent to that specific button. As such, we tend to render this button slightly differently than the other buttons, thus notifying the user of the situation. As you can see in the image above, the image is broken into a 3x3 grid. The width of the grid items are defined by the values mentioned above. So, using our example, the margins are each three pixels. That means that the top three pixels and bottom three pixels are not stretched vertically and that the left three and right three pixels are not stretched horizontally. Using that logic, the corners are each 3 pixels by 3 pixels and are not stretched at all. Using these values, you can create rounded corners, jagged edges, etc. and have them look correctly when stretched. WisBar Advance allows for the skinning of checkboxes and radiobuttons. Each control is represented by a single graphic as defined by the checkbox and radiobutton values, respectively. Checkboxes consist of six equal size glyphs. The first glyph is the unchecked state followed by the disabled unchecked state. Next is the checked state followed by a disabled unchecked state. Last is the indeterminate state (for 3-way checkboxes) followed by its disabled state. Radio buttons follow the same format, but instead of six glyphs, the image contains four equal size glyphs. The indeterminate state is not available for the radiobuttons. Fonts are defined just as they are in the sections described above. The sections are called "Buttons Normal Font", "Buttons Pressed Font" and "Buttons Disabled Font". If you notice above, the font information is combined with the other settings for the start menu. Using the "Image Mode" parameter, you can control the background of the start menu. With the mode set to "WA2", you can specify images for the background(s) of the start menu. The values that do this are "Start Menu Picture" and "Start Menu Picture 2". If values are not provided for these, then the start menu image provided by the current Today theme is used. The second start menu picture is used for all menus below the first menu, thus providing a little variety in the appearance of the menu. If you want to stretch the images, you can specify the right and left margins. Any pixels that fall within the margins are not stretched, while anything in between will be. For the first level of the start menu, use "Left Margin" and "Right Margin". All subsequent levels use "Sublevel Left Margin" and "Sublevel Right Margin". If "Image Mode" is set to "Color", the start menu will use solid colors for the background and highlight colors. These options are "BKColor" and "HighColor", respectively. You can also change the icons for the special items on the start menu. The values that control these icons are "Program Group", "Settings Group", "Help Icon", "Find Icon" and "Desktop Icon". These images allow transparency using the color RGB(255, 0, 255). The dimensions of these images should be set to 16x16 on QVGA devices and 32x32 on VGA devices. You can also specify the arrow that appears when there is a submenu associated with an item. This is controlled by "Submenu Arrow". The labels above correspond to the aliases used by the shell to represent certain shell events. So, for example, the "Open" sound is used when a new window has been created and the "Close" sound is used when a window is closed. If you do not specify a sound, the default sound (if there is one) will be played instead. One thing to remember is that WA does not actually generate these events, so they may not always play when you would expect them to. These sounds can't be just any type of sound file. They must be WAV files in the PCM format as this is what the OS supports. If you have a sound file and you're not sure what format it is in, then on your desktop launch "Sound Recorder" (provided with all versions of Windows) and load up the sound file. Using this program you can convert the file to PCM format, adjust the volume and add special effects to the sound. The task panel can use a single font for all of the text displayed. As such, the font settings are identical to those found in other sections already mentioned. However, there are two values specific to the task panel: "Title Color" and "Selected Color". The title color specifies what color the font will use at the top of the panel while the selected color will determine the color of the individual items when they are highlighted (or selected). This option is primarily used for backwards compatibility with WA2. To specify the title font and selected item font separately, create two sections called "Task Panel.Title Font" and "Task Panel.Sel Font" and use the parameters described earlier in this document. The images, "Top Bar", "Bottom Bar", "Item" and "Selected" refer to the top and bottom of the panel, the background for each item and the selected image for when an item is selected. Each button has corresponding stretch margins (as detailed in various sections above). These values are indicated by the appropriate "Left" and "Right" values. The top image also uses the "Title Top" and "Title Bottom" values. These are not stretch margins. What they indicate is how many pixels from the top and the bottom the title text will appear. Leaving these values at -1 will cause WisBar to center the text in the title area. If you want to display the title (which is "Tasks") in the top bar, set the "Show Title" option to TRUE. You can then use "Title Left" and "Title Right" to specify offsets for the title's alignment property. "Image Count" and "Buttons" apply to both modes. The image specified by "Buttons" defines the images that are interspersed with the application icons. The latest release of WisBar Advance supports ten images. If this value is omitted, the image count will be defaulted to ten. WisBar has the ability to place an icon in the taskbar that represents a specific notification. For example, the builtin Inbox/Messaging application typically displays an envelope when there is new email to view. WisBar can display any icon on the taskbar, instead of using the standard icon. First, the numbers in the [Custom Notification] section [b]does[/b] matter. The numbers need to start at zero and increase sequentially (i.e. 0, 1, 2, 3, ...). The notifications assigned to the numbers do not matter. However, WisBar reads this section using the numbers until it finds a break in the sequence. Of course, the <Path to image> should be replaced with a path to the appropriate graphic. New to WisBar Advance 3 is a customizable start panel. This is a simple panel, similar to what you get when you select Start > Programs on the builtin start menu. However, this panel allows you to specify the background and font. These sections should be pretty self-explanatory by now. Unlike most of the settings above, the "Path" field must point to an animation file, not an image file. The animation file provides the necessary information to animate the cursor properly. Please make sure you reference the information about animations at the top of this documentation. The "Background" specifies an image that will be rendered across the entire battery bar. The "Power Image" specifies an image that will be repeated on top of the background, indicating how much power is available. It is important that this image be small enough that it can be repeated several times. The "Charge Image" is rendered the same way the "Power Image" is rendered, except that it's only displayed when the device is charging.